Fine furniture and other fine woodworking projects are enhanced by handcrafted wooden hardware. Wooden hinges accent wooden furniture and wooden doors and showcase detailed craftsmanship. In addition to aesthetics, wooden hinges are functional. They are quiet and if maintained can last for generations. Some common applications for wooden hinges include hope chests, wooden cabinets, and jewelry boxes. Although they look difficult to make, a basic understanding of the techniques is all that is required for you to start making beautiful wooden hinges. Measure in 1/2 inch from each end of the three-inch side of a 1-by-3-by-4 inch cherry board. Mark this spot with a pencil. Use a drill press and 3/8-inch drill bit to drill a hole down through the board at this mark. These are the holes for the hinge pin to slide into. Place one 1-by-3-by-4 inch cherry board on a work surface. Measure in one inch from each end with a tape measure. Mark those measurements with a pencil. Measure up one inch from that mark. Mark that measurement with a pencil. Use a straight edge to draw a straight line from each of the points to create a one-inch box on each end of the board. Set up the table saw with dado set to make a one-inch by one-inch cut. Cut out each one-inch box on each end of the 1-by-3-by-4 inch cherry board. This is one half of the hinge. Place the other 1-by-3-by-4 inch cherry board on a work surface. Mark the center of the board. Draw a one-inch box in the center on one edge of the board. Cut this box out using the same set-up on the table saw. This is the other half of the hinge. Measure in one inch from the each end on the side opposite the one inch-by-one inch cuts in the hinge sides. Mark these measurements with a pencil. Use a drill press and 1/4-inch drill bit to drill a hole through the hinge sides at these marks. These are the holes for the screws. Place the 3/8-by-3 inch dowel on a work surface. Center the 3/8-inch plug on one end of the dowel. Place a dot of glue where the plug and dowel join together. Use a hammer and 2-inch finish nail to fasten the plug to the dowel. Wipe off any excess glue with a damp rag. This is the hinge pin. Sand the surfaces of the hinge parts with 120-grit sandpaper. Apply a wood finish of your choice to the hinge parts. Allow the wood finish to dry. Assemble the hinge. Place the two sides with the one inch-by-one inch cuts in them together. Slide the hinge pin into the hinge pin holes until the plug rests on top of the hinges. Use four wood screws and a screwdriver to fasten the hinge to your project. Use a wood that contrasts the rest of your wood project for the hinges. 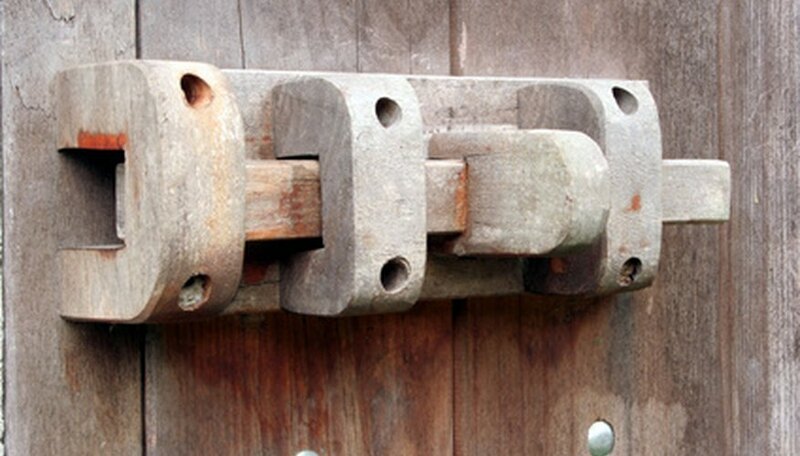 Your wooden hinges will accent the overall project beautifully. Wear eye protection when working with wood. Follow tool safety precautions for safe operatoin.